The four Game of Thrones episodes that leaked earlier today have been downloaded millions of times already. A snapshot of the download locations reveals that most downloaders currently come from the UK and the US, followed by India, Canada and France. Today’s pre-release leak of four Game of Thrones episodes is without doubt one of the most prominent leaks in TV history. The first copies, leaked from a review screener, appeared less than 24 hours ago on the private tracker IPT and quickly spread across public torrent sites. During the first few hours there weren’t too many downloads, but that quickly changed after the news reached the mainstream press. 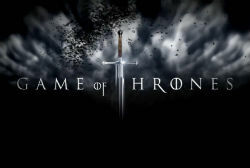 At the time of writing more than 135,000 people are sharing a single torrent of the first episode of season 5, which has already been downloaded over a million times since its release 18 hours ago. The other three episodes are hovering around a million downloads as well, and that’s only via public torrent sites. The piracy totals will most likely double if the totals of streaming and direct download sites are added. While there’s certainly a piracy craze, with the four leaked episodes being the most pirated files globally at the moment, there’s no record to report just yet. The unexpected release appears to have scattered the downloads throughout the day. As a result, last year’s record of 254,114 people sharing a single file at the same time is out of reach. Still, more than a million downloads for a single episode in less than a day is quite impressive. A snapshot of IP-addresses sharing the most downloaded episode shows that most originate from the UK and US, followed by India, Canada and France. While all those pirates are surely having a great weekend now, the hangover will probably come later with the realization that it will take more than a month before the next episode comes online. Note: The numbers are based on a sample of 21,445 IP-addresses collected over part of the day, which means that there’s a geographical bias. Also, downloaders who use VPNs may appear to be in a different country.